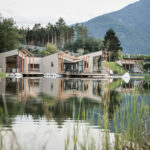 Hotel Tofana in St. Kassian, Italy, owned by Gunther and Verena Frena, has been redesigned by the architecture company, noa* (network of architecture). 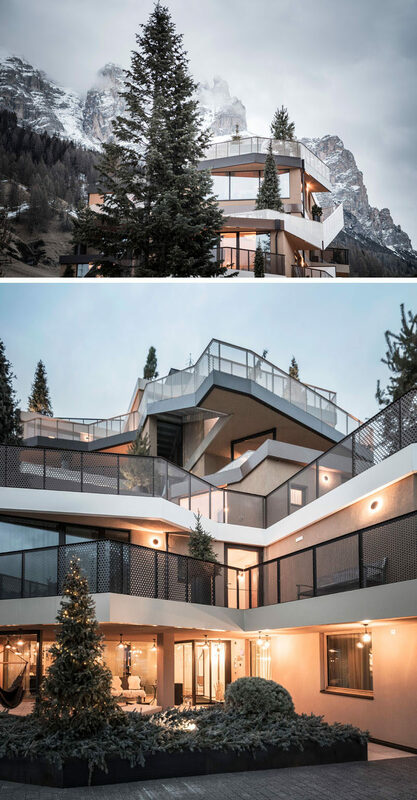 The two toned, exterior silhouette of the building was designed to mimic the tops of the Dolomite mountains that grace the landscape around the hotel. 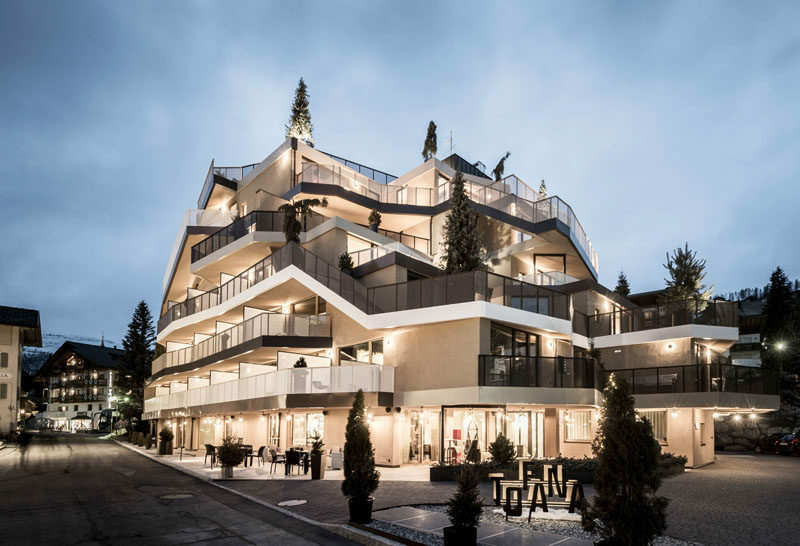 Terraces and balconies are lined with coniferous trees and plants, which are connected by vertical ramps and stairs, create an illusion of a summit for the hotel. 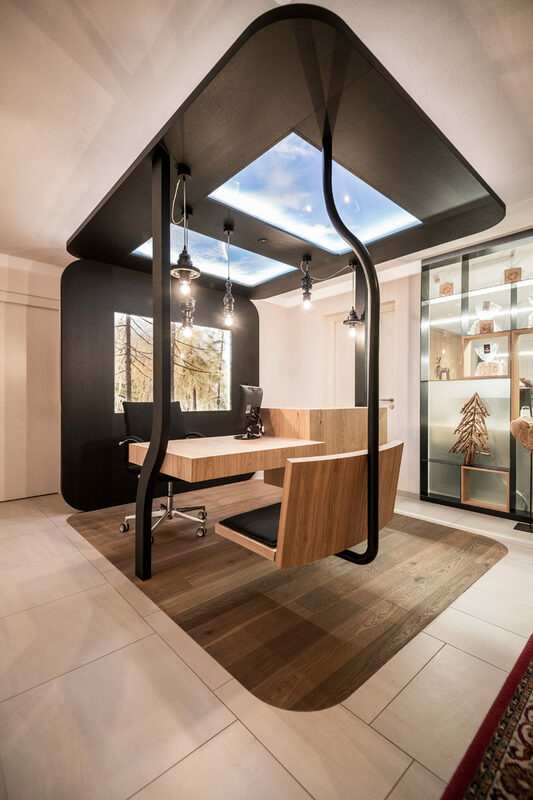 Once inside the hotel, guests arrive to a hanging chair and desk with a two panel skylight. This gondola-style check-in prepares a guest for their unique hotel experience. The lobby is designed with shades of green to create a sense of being in the alpine meadows and forests that surround the hotel. Multi-height lighting and shelving creates a sense of depth, while the various sizes and shapes for furniture invite a person to lounge. 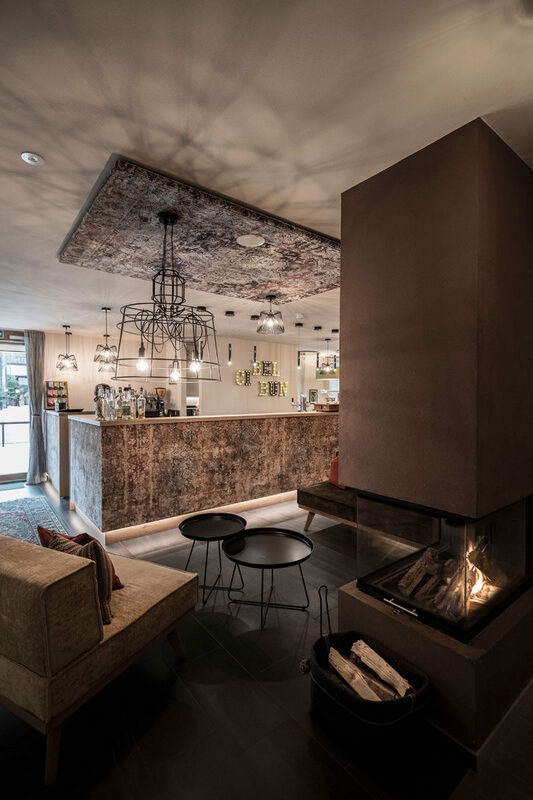 The various shades of warm brown hues and the fireplace make the hotel bar a welcoming place to wind down after a day of exploring. The contemporary pink light fixtures hanging from honeycomb details are the focal point in the hotel restaurant. Round wood tables, with dusty pink and gray wool upholstered chairs help to create a cozy atmosphere. Intimate, floating table nooks stand out in another one of the hotels restaurants. 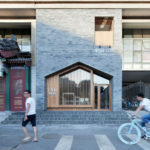 Various shades of brown are used for the minimalist furniture, while black is used for the hanging light fixtures, tying them in with the wildlife artwork on the walls. Floating, wood boxes with hidden lighting are attached to the walls and ceiling in this casual restaurant space, while different shaped bronze light fixtures add a metallic touch. This hotel room has an open floor plan that’s broken up by a wood vanity with a hanging mirror. The bathroom is defined by red and white patterned tiles that match the red sofa. Green and white tiles designate the washroom in this hotel room, with a mirror hanging from the ceiling and a wood vanity being used again. The bed sits opposite the gray sofa, and appears to be floating because of the LED lights hidden underneath. The mauve sofa faces the balcony in this room, and matches the color of the floral patterned tiles in the washroom area. 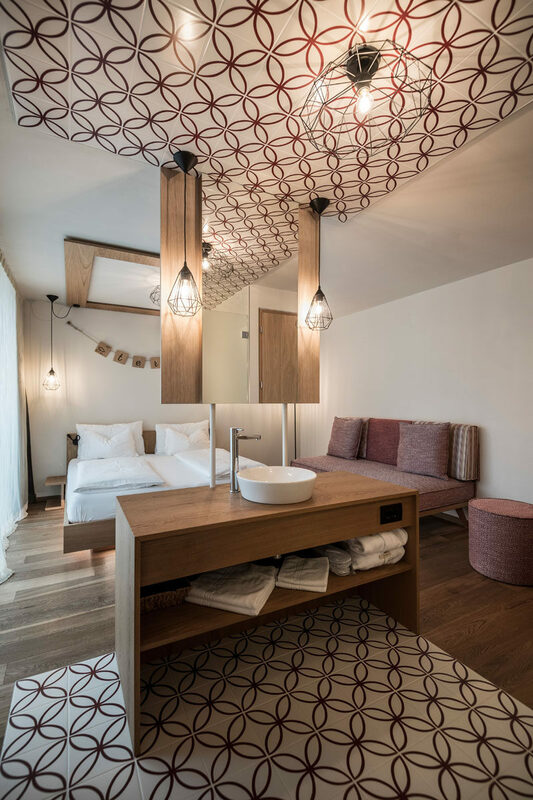 Geometric shaped light fixtures, and a glowing LED bed brighten up the room even more. Floor to ceiling tree lined wallpaper surrounds this gray carpeted space with tiered benches. 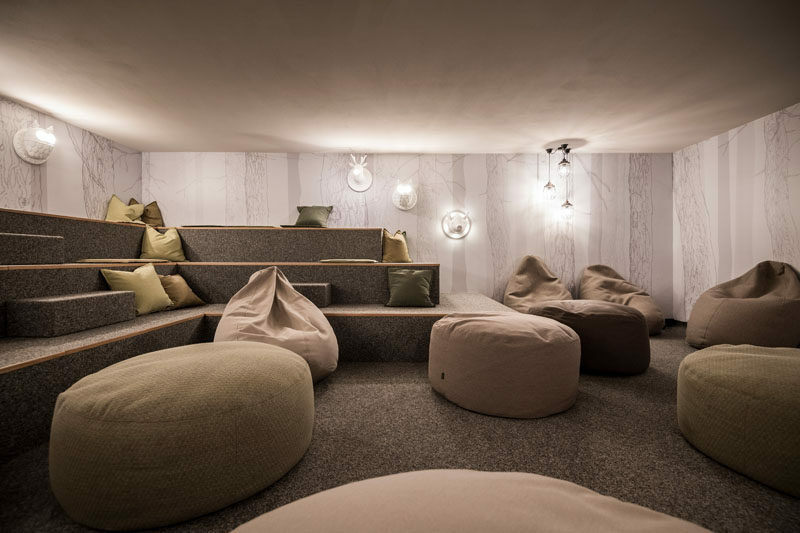 Animal light fixtures, and earth toned cushions and bean bags make this a perfect place to chill after adventuring in the wild. 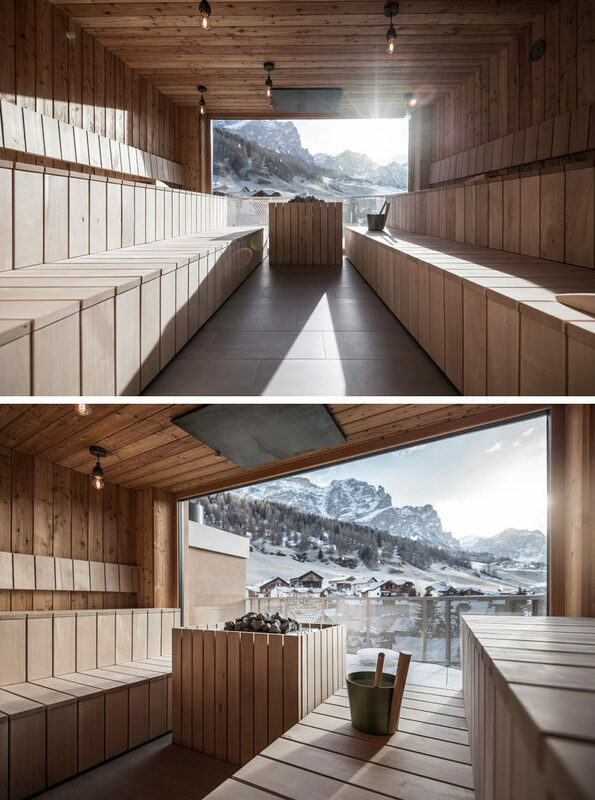 The hotel also has a spacious sauna that’s paneled in light wood, and has a floor to ceiling window at the end of the room that allows for views of the mountains. 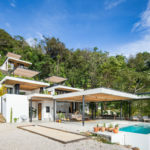 Outside, there’s a hot tub surrounded with small pine trees, creating the effect of being on the mountain top while still in the pool.